If I learned one thing from my first day of work with the Handy Maniac, it was: I need to go shopping. At first, HM is excited when I tell him this, thinking I want to buy some tools. I am giddy as I pull on my new 5-pocket Smith’s denim carpenter’s pants. My favorite part of any new job is figuring out the perfect outfit. I figure if I have the right costume, it will help me slide into my new role. The problem is, I usually show up in what I imagine the right costume is, not what people actually wear. For example, Bun-ettes at Nathan’s Famous July Fourth Hotdog Eating Contest don’t actually wear red mini-skirts, sequined tank tops, high-heeled sandals and dangly star earrings or have big hair. Go figure. Today, HM is responding to an emergency call at our local watering hole, where there is water leaking into the basement. I decide this is an excellent time to type up some notes. From about twenty feet away. After cleaning the toilet and floor thoroughly, HM removes the toilet seat and carefully sets it aside. Next, he shuts the water supply to the toilet off. He flushes to get rid of water in the tank, and plunges the toilet to get rid of the water in the bowl. Then he disconnects the hose line from the toilet tank and drains it into a small bowl. “DOGGIE BOWLS WORK GREAT,” he calls out. It does seem preferable to anything a human will ever eat out of again. “Sometimes the Johnny bolts are too rusty to get off with wrenches.” We debate how to spell Johnny. (Jonni, Johny, Jonnie) The Internet doesn’t really settle it. It takes me awhile to realize they are called Johnny bolts because they bolt the “John” to the floor. There are a lot of terms like this in his line of work. I start to contemplate an OED for construction. ...but I am jolted back to the reality. VIEWER DISCRETION ADVISED. THE FOLLOWING PHOTOS CONTAIN GRAPHIC IMAGES OF TOILET REPAIR THAT ME BE UPSETTING TO SOME. 1. 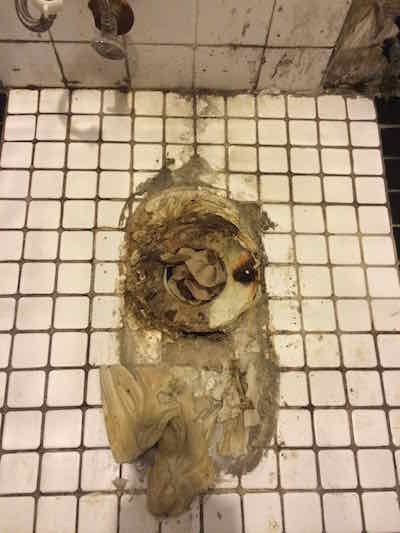 With the toilet removed, it is clear the wax ring has deteriorated. 2. The paper towel trick to block sewer fumes. 3. Removing the WHOLE SHEBANG to fix broken flange and waste pipe problems. (Grad-level). 4. Installing a new flange. “YOU WANT A TIP?” he calls out. Spoken like a man who has made that mistake. He ignores me as he scrapes off the water-damaged wax ring (now deteriorated by urine and water and gunked-up with dirt) and places it on old newspaper. “It’s right here at the top of the waist line.” He points and I realize he means waste line. In some wishful listening, I have heard the homonym. This job is making it hard for me to stay in the present. It is triggering a strong escape response. “You have to MUCK AROUND to get the broken flange up.” He pries and bangs with various pliers. Plumbing Still Life, with HM Poking Around in Basement. When he returns I ask what he was doing. I don’t want to miss out on any crucial steps. 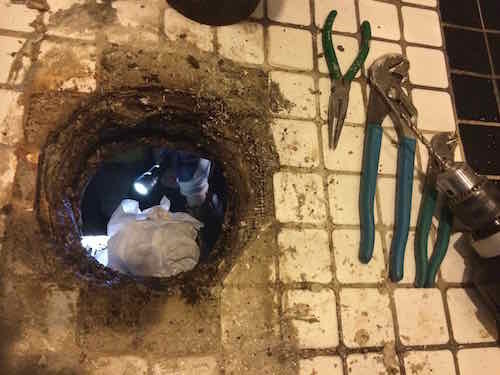 He agrees this is beyond the typical home-repair job: “This is basically like a Myth Buster’s explosion gone bad.” Still, we are not beyond HM’s skill set. So you, dear reader, get to witness this slight detour into advanced techniques. He pulls out his corded drill and drills out the flange. Once he has the whole thing out, he decides to check the other connections in the basement, suspecting some of those may be bad. “GOOD A TIME AS ANY,” he says as he heads towards the basement for the twelfth time. I’m starting to feel like a fraud in my carpenter’s pants. “Can I do anything?” I offer half-heartedly. He hands me a bucket and tells me to pour it slowly down the floor drain so he can check for leaks down below. I do this job very well, IMHO. I am learning the fine art of patience. Just a week ago I would have sloshed the water all over the floor, pouring too fast. But now I am slow and steady. “WE DON’T HAVE ALL DAY!” He finds a couple more slight leaks on the connecting pipes. “Nothing too tragic.” They just require some band-tightening. He returns. Now he has to rebuild the whole busted section he has pulled out: flange and waste pipe. He re-sets the newly-rebuilt waste pipe and screws in the new flange. (He Boy-Scouts it and cements in the new flange since this is a high-volume facility). He inserts the Johnny bolts into the key ways on the flange so they are sticking up, ready to go through the holes in the base of the toilet. Now we are back to where the homeowner can rejoin us: The final step. The new wax ring. “Uh oh,” I say. He sighs. He is not about to get into the finer points of wax-ring thickness. “Just have a discussion with your retailer.” Anyone who’s selling them should be able to talk you through the tile issues in your bathroom that dictate the thickness you should use. You want the wax to be thicker than the gap it is filling (and that’s determined by your floor tile). He sticks the wax ring on the base of the toilet, then drops it carefully on top of the Johnny bolts. “THIS IS PROBABLY A TWO-MAN JOB.” Once the wax is pushing against the top of the toilet and the flange, jiggle the bowl to compress the wax. “I like to use toilet bolt caps (sometimes called china caps), to keep urine off the bolts.” Good plan. The correct order: China cap washer, metal washer, nut. Then saw the bolt and place the china cap. Voila. “I like to the jiggle toilet as I am tightening to see if I have a bad spot on the floor. I want to make the toilet level,” he explains. If it moves too much, take plastic toilet shims and place them under the base until it is steady and level. (Place your level across the bowl.) Cut the shims if they protrude. “The last thing I do is put a bead of clear silicone around the whole base. THIS IS IMPORTANT.” He likes to seal the deal. I argue that this is what the day brought. It’s part of being the Handy Maniac. This is Blogging Verité. Besides. I am not writing another post by tomorrow. The cycle of life: HM reviews the day's blog post over a beer that will be recycled in the very toilet he fixed.